Dry-aged, grilled 8 oz. filet with crispy new potatoes, pickled chanterelles, lardons, BCF farm greens topped with braised oxtail and red onion mostarda. 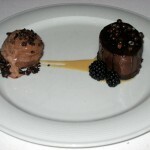 We rarely give out perfect scores, but the chef at Jeffrey’s really deserves it with this creation. We ordered the filet cooked medium-rare and it was grilled to absolute perfection. It isn’t possible to have a more juicy and tender filet. The filet was topped with braised oxtail and mostarda (Italian condiment made of candied fruit) which provided a burst of flavor with a touch of sweetness. Instead of the usual 3 or 4 sprigs of asparagus, this dish is served with unique and complementary sides. Along with potatoes, there are yummy chanterelles (a type of exotic mushroom), lardons (French bacon), and greens from the local Boggy Creek Farm. 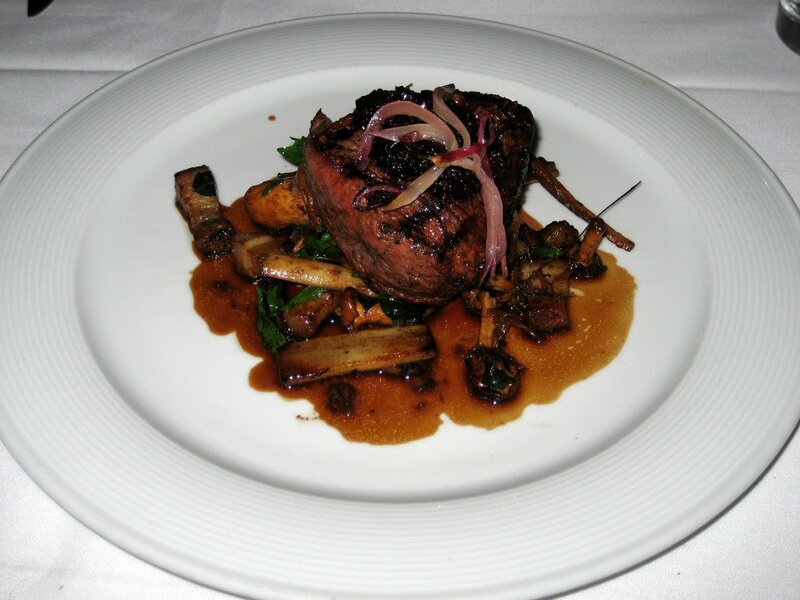 We had dreams of filet mignon that night…and we can’t wait to order it again! Wood-grilled 6 oz. burger on foie butter-rubbed sesame seed bun with hydroponic red romaine, and grilled onions with sides of grain mustard, ketchup, aioli, and pommes frites. 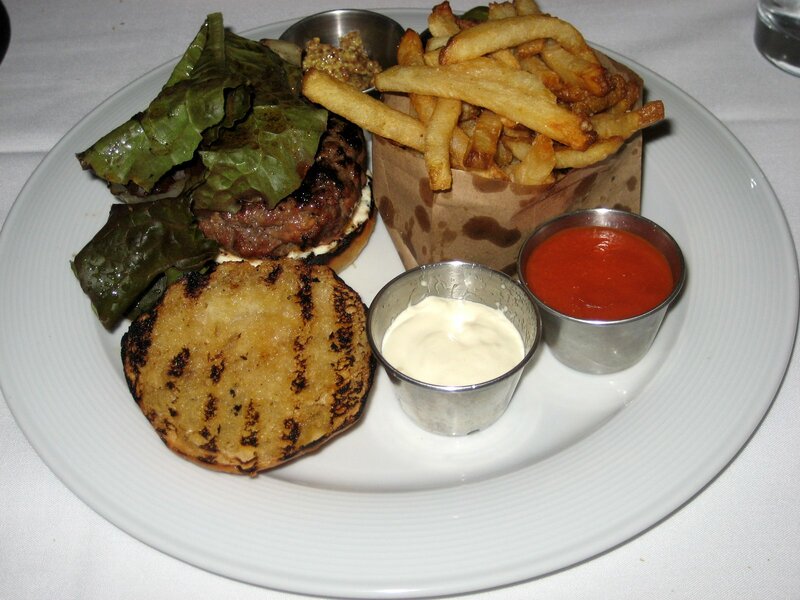 We love the idea of an upscale burger! We loved eating it even more. We ordered the burger cooked medium. For a few dollars extra, one could add cheese, bacon or foie-gras. The sesame bun was delightfully charred just a bit, which gave the buttery bread a perfect texture. The beef was tasty and delicious, but was a bit on the small side considering the price. 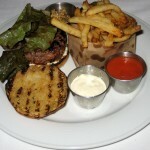 The crispy french fries were addictive, and we enjoyed adding the aioli and mustard to both the fries and the burger. 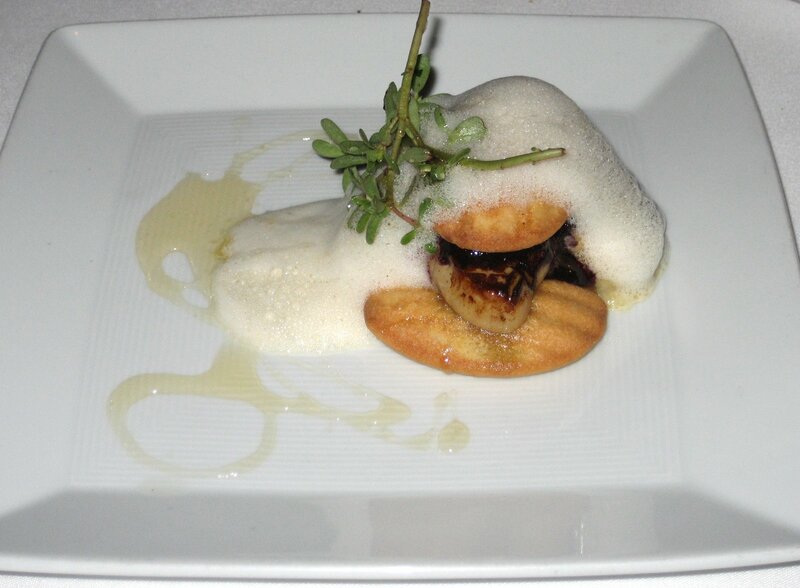 Seared goose liver sandwiched between madeleines and covered with lavender honey foam. The sweet lemon madeleines made a nice base for the foie-gras, but the grape jelly that was smeared on it seemed out of place. The lavender honey garnish didn’t add much to the dish either – it felt like we were eating lavender soap suds. 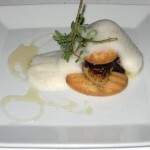 Although there were several sweet items on the plate, the distinct foie-gras flavor still came though. The texture was mushy and formless, and we thought it would have a silkier texture. This one was not our favorite. 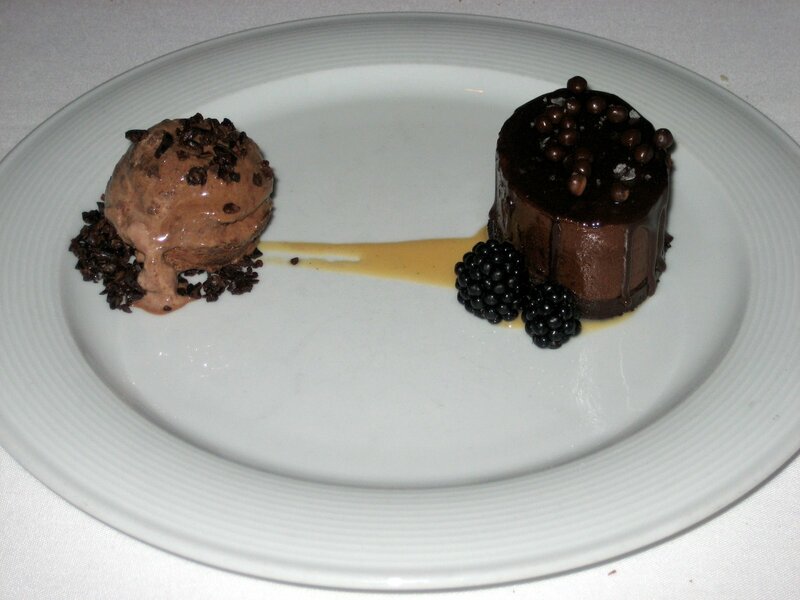 Flourless chocolate cake with Valrhona dark chocolate mousse, double chocolate ice cream, with chocolate shavings. We are aware that the word chocolate was used many times in the description of this luscious cake! It is not for the weak. Only true chocolate worshippers will be able to appreciate the rich, densely packed flavor. The ice cream was more cream than ice, which complemented the flourless cake well. The only thing we didn’t care for were the round chocolate balls on top because they were so salty and detracted from the overall taste. Order this cake because you will want to lick the plate clean… and maybe we would have if the restaurant was not packed solid! We made reservations and arrived on a busy Saturday evening. We had to wait about 10 minutes and then we were promptly seated by the polite hostess. Our waiter was knowledgeable, friendly and professional. We learned that some of Jeffrey’s waiters have been there for over 20 years! Our evening started out with a complimentary plate of warm gougère (a small French pastry) to awaken our appetites. Throughout the entire dinner, our waiter was attentive without being overbearing. Besides some yummy wheat bread, we received another amuse bouche – this time a deliciously spiced watermelon and tomato soup, with tiny cheese crumbles in it. This whet our appetite some more and our entrees came out soon afterwards. The wait-staff knew we were celebrating a special occasion, and two complimentary glasses of champagne were brought out to us. We felt really pampered and were impressed by their thoughtfulness. We thought it would be a good idea if they incorporated just a few more actions that are common to upscale restaurants. For instance, brushing breadcrumbs off the table or refolding the napkin if the patron is not in his or her seat. Still, Jeffrey’s has set the standard high with their superior service. Jeffrey’s is located in a quaint area in central Austin. They have valet, and street parking is also available but it can be difficult to find an open space. The valet actually blocks off a portion of the street parking. This establishment has 4 cozy rooms and a classy bar area with two lovely chandeliers. The tables in the room are dressed in white linens, with handsome dark wood chairs. The interior is dimly lit, the ground has a modern pebbly appearance and feel to it, and there are a few tastefully framed art pieces on each wall. Speaking of tasteful, the food at Jeffrey’s is a blend of contemporary Texas cuisine with influences from around the globe. There was some soft background music, but keep in mind that this restaurant can be very noisy on a busy evening, which makes for a less romantic setting. That will not deter us from coming back as often as our wallets will allow! Perhaps we will try their happy hour next. The uniquely prepared entrees, exceptional service and warm ambiance make for a wonderful dining experience.